Wish you could cover the real Seven Summits? No need to sweat too hard, Phoenix has its own miniature version. Named after the highest points in seven of the city’s mountain parks, The Seven Summits of Phoenix will keep you grounded while you scale some the Valley’s best hiking areas. Hikers hike Camelback Mountain trail. 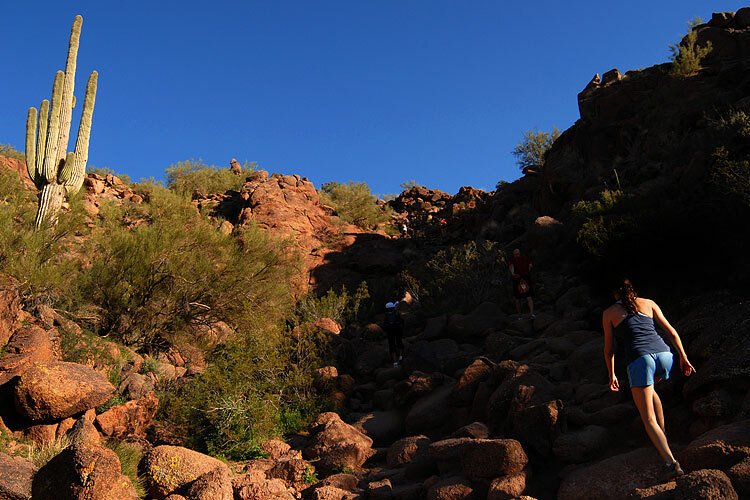 At 2,704 feet, Camelback Mountain can call itself the Mount Everest of the Valley. Claiming one of the premier views in Arizona, the 2.3 mile roundtrip hike starts from the Echo Canyon Trailhead, ascending ridiculously steep and slippery rock areas through a boulder-filled gully. Where: From the intersection of McDonald Drive and Tatum Boulevard in Paradise Valley, take McDonald east about a tenth of a mile to the signed entryway to Echo Canyon Recreation Area on the south side of the street. Start out on South Mountain’s Holbert Trail, which begins about a half mile east of the South Mountain Environmental Education Center. After passing a large water tank, the trail bends southward and begins a steady grind up a rugged canyon. The Holbert Trail ends about a quarter mile after crossing the Summit Road, at the well-signed junction with the National Trail. From there, walk west along the T.V. Tower Road until you reach the lookout point. Where: South Mountain Park, about a half mile south of Dobbins Road on Central Avenue. The trek to the top of 2,608-foot-high Piestewa Peak is hiked by about a half-million people walking the trail each year. With a steep path that requires all four limbs, the breathtaking 360-degree view from the summit is the icing on top. Where: From Lincoln Drive, turn east on Squaw Peak Drive and go another half mile to the park entrance. Choose from either the short hike along the North Mountain National Trail with fine views or the 2,104-foot summit. Begin the hike near the Maricopa Ramada, at the northern end of the loop drive through North Mountain Park. Quickly heading uphill, the trail will quickly take you to a lookout with expansive views to the east. Follow through on an asphalt road to the top of the summit. Where: North Mountain Park, Phoenix Mountains Preserve. Although the 2,149-foot summit isn’t easily made access to the public, the stooped route is paved along the high-elevation trail. In the end, the myriad natural views are all worth it. Where: The largest parking area is off Seventh Street, about a mile and a half south of Thunderbird Road. Though the 1,928-foot-high Shadow Mountain is part of the Phoenix Mountains Preserve, the small cluster of peaks has no official trails, but crisscrossed used trails, giving you a creative choice of several routes to the summit. Where: The mountains stand just north of Thunderbird Road and east of Cave Creek Road in north Phoenix. Little known compared to its counterparts, this northernmost segment of the Phoenix Mountain Preserve at 2,054 feet offers hikes that will lead you to gorgeous 360-degree views of the north Valley. Where: From the north Valley, take Loop 101 to Seventh Street, then go south two miles to Bell Road. Turn east and go one mile to 16th Street. Turn south and go three-quarters of a mile to the parking area.